India hosts a big share of climate mitigation projects under the UN’s Clean Development Mechanism (CDM). Many of these projects have blatantly violated the rights of affected communities and stakeholder consultations are carried out rarely if ever, writes Soumya Dutta. The Clean Development Mechanism (CDM) was set up to help developed countries achieve their emissions reduction goals by purchasing credits from potentially lower-emission development projects in poorer countries. Another major objective of the CDM was to help poorer countries to sustainably develop their economies through less carbon-intensive pathways. As of March 2015, most CDM projects were in China, India, Brazil, Mexico, Malaysia, with a handful being implemented in the Least Developed Countries (LDCs). Out of about 7600 CDM projects registered, approx. 50% has gone to China with India getting another 20%. That gives Indian (and Chinese) civil society the added responsibility of carefully evaluating whether these have achieved their desired objectives or not. One of the key conditions for achieving sustainable development is to fully involve the affected communities in the development and implementation of the projects, including by allowing them to visit the project sites. I have visited numerous CDM projects; massive coal power plants using supercritical boilers, solar PV plants, and wind power farms, in multiple states of India. The common feature is the near-complete lack of information sharing and transparency by the project promoters and government authorities! In almost all places, the local communities adversely impacted by these CDM projects have never heard about the CDM, nor its supposed ‘sustainable development’ benefits for locals. Below are a few examples of stark cases of violation of fundamental rights, neglect and even violence against communities. 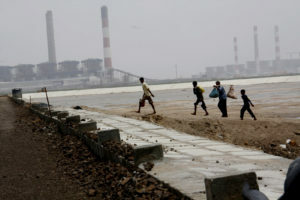 A massive 4620 MW CDM-registered coal power-plant was built on the shores of Gulf of Kutchh, in Mundra, Kutchh district in Gujarat by one of India’s largest corporations, Adanis. It is expected to earn about US $100 million through CDM over 10 years. Thousands of fish-workers who camp on the coastline for 7-8 months a year were displaced, losing their livelihood. However, they were not considered affected by the project, as they didn’t own that land. Biologically productive creeks and rocky reefs were blocked and destroyed, coal dust ruined all nearby grazing land, the local small scale salt-panners were distressed because their produce was getting contaminated by coal dust and fly-ash. Yet, none of these people were informed of the plans beforehand nor were their opinions asked. After prolonged fights, aided by civil society organisations and the fish-workers union, they could manage to get paltry compensation, such as solar powered lamps for their boats, some books for their children etc. None of that could, of course, compensate for the loss of livelihoods, due to the destruction of their fishery and sharply reduced fish catch. While submitting India’s climate commitment before the Paris climate summit, the Indian Prime Minister announced a grand target of installing 100,000 MW of solar PV and 60,000 MW of wind power capacity by 2022. With incentives from the central and state governments, many corporations have started establishing wind and solar power plants that are often registered as CDM projects. Rajasthan with the large Thar desert is seen as ideal for both. On two separate visits to 14 such power plants – large, medium and small – we came across the same stories. Affected villagers in Jaisalmer district of Rajasthan were sitting in protest in front of the district court. The villagers had not been informed nor consulted on the projects. The ‘Solar Parks’ have enclosed thousands of hectares of arid land, which are vital for the pastoralist lifestyles and livelihoods in the rain-scarce area. The only water well within 2-3 villages has been taken over by the solar company, to wash the solar panels, depriving sheep and goats of access to water. Right next to the Desert National Park in Jaisalmer, the only remaining habitat of the critically endangered “Great Indian Bustard”, wind turbines have been put up, disregarding even wildlife protection laws. Some of these big birds got hit and died. In Kanoi village, dozens of people complained about the encroachment of the wind turbines – sprouting up right outside the village residential boundary. Trucks carrying heavy turbine blades have destroyed the delicately constructed water harvesting system in this desert region. Local stakeholder consultation? That’s a concept not heard here often. What is painfully apparent is that these CDM projects are violating almost every transparency and sustainable development condition. With full impunity.